Q: FIRST AND FOREMOST, IS THE 2018 HUSQVARNA ROCKSTAR EDITION BETTER THAN THE 2017 ROCKSTAR EDITION? A: No, because there wasn’t a Husqvarna Rockstar Edition in the 2017 model lineup. It is a new model. You might be tempted to call it the 2018-1/2 Husqvarna FC450 “Factory Edition,” because it essentially mimics the concept behind the 2012 through 2018 KTM 450SXF Factory Editions; however, if you call it a “Factory Edition,” both Husky and KTM will be upset. Why? Because the KTM version could well be named the “Red Bull Edition,” since these models were built for KTM’s Red Bull-sponsored race team, while the Husqvarna version is built for its Rockstar-sponsored race team. Neither company wants the inevitable confusion. Q: WHY ARE THE HUSQVARNA AND KTM SPECIAL EDITIONS BEING BUILT AT ALL? A: Back in 2012 Roger DeCoster needed a fuel-injected, 450cc, purpose-built motocross KTM to fulfill his commitment to Ryan Dungey, who had left Team Suzuki on the promise of a new machine at KTM. Roger cajoled KTM’s management into building a works bike for Ryan Dungey. 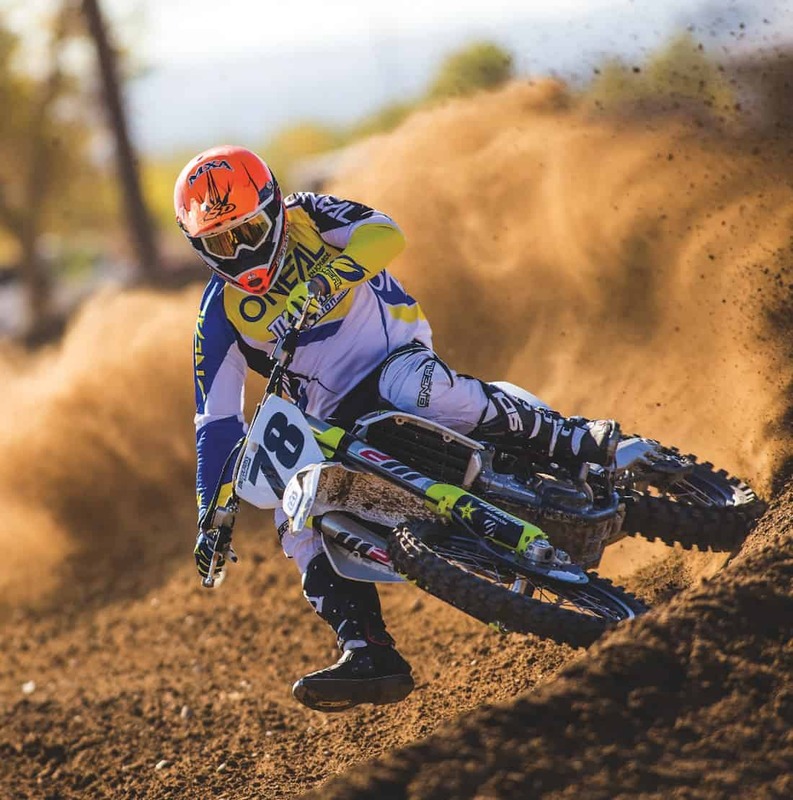 The fly in the ointment was that the AMA had banned one-off works bikes back in 1986—the only bikes that could be raced in the 2012 Supercross series were existing 2012 models. But, Roger DeCoster was not deterred by the rulebook; instead, he found a loophole. The magic loophole in the AMA homologation rules was that Roger could provide star pupil Ryan Dungey with a full-blown works bike for the 2012 season if KTM would make 400 of them. Q: WHAT IS THE LOOPHOLE? A: Under the AMA homologation rule, no one can race a bike that isn’t produced and sold to the public. To be a legal race bike for any given race season, a manufacturer must produce at least 400 bikes and offer them for sale to the public. Roger realized that if KTM made 400 special race bikes as 2012 models, then Ryan Dungey could legally race one of them in 2012. KTM agreed and accelerated the timeline of the 2013 KTM 450SXF and built 400 of next year’s bike seven months ahead of schedule. KTM and DeCoster thought that this special run of loophole-bending bikes would be a one-time deal, never to be repeated. Wrong! The 2012-1/2 KTM 450SXF Factory Editions sold out at a premium price, and the one-and-done concept became a yearly model. A: No. DeCoster followed the homologation rules to the letter of the law. The Factory Edition (and Rockstar Edition) are officially 2018 models and are thus legal in the 2018 Supercross series. It should be noted that there is nothing stopping Honda, Yamaha, Suzuki or Kawasaki from dong the exact same thing—if they had the will to do it. Q: WHAT IS THE ONE THING YOU REALLY NEED TO KNOW ABOUT THE ROCKSTAR EDITION FC450? A: The biggest takeaway is that the 2018-1/2 Rockstar Edition is the 2019 Husqvarna FC450—minus the graphics, pleated seat cover, front brake rotor guard, Rekluse clutch cover, skid plate, and whatever damping and mapping changes that Husky’s engineers learn from Rockstar Edition owners in the ensuing months. For all intents and purposes, this is the 2019 Husqvarna FC450. Virtually every part of the bike has undergone major changes—most noticeably the exhaust, frame and plastic bodywork. Q: HOW DOES THE ROCKSTAR EDITION’S ENGINE DIFFER FROM THE 2018 PRODUCTION ENGINE? 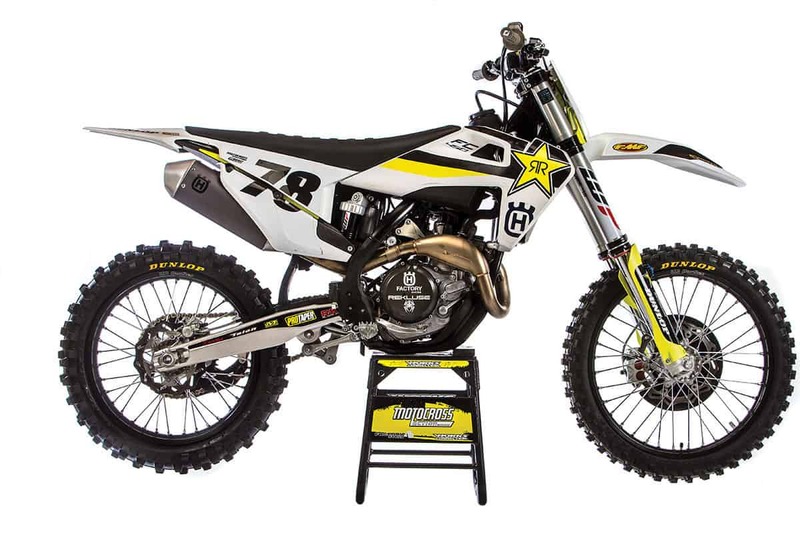 A: Now that we know how Ryan Dungey got his own personal one-off race bike from 2012 to 2017, let’s take a look at how the 2018-1/2 Rockstar Editions of Jason Anderson and Dean Wilson differ from the 2018 Husqvarna FC450 production bike. Engine cases. 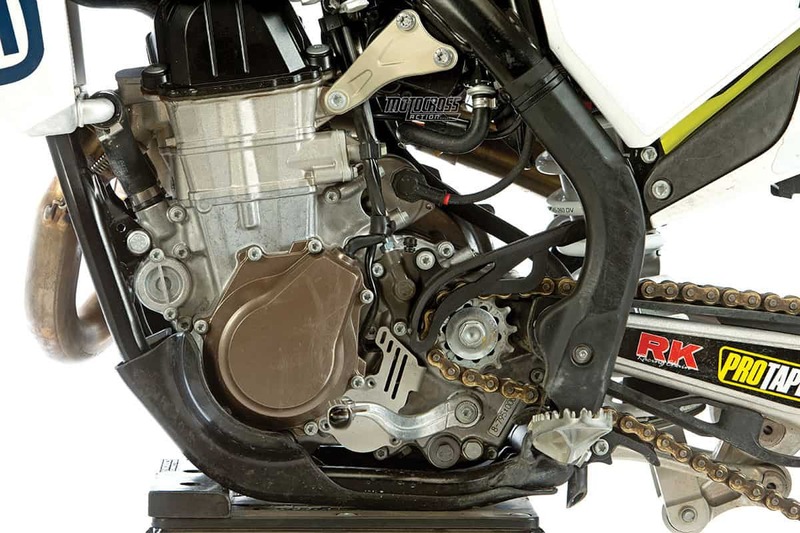 The bottom end of the FC450 engine is identical to the 2018 production bike. Cylinder head. The head is totally new. It is 15mm lower. That doesn’t mean that the engine is lower in the frame, only that the camshaft is mounted 15mm lower, which means shorter cam towers, shorter valve stems and a 15mm lowering of the cylinder head’s rotating mass. The engine is 1 pound lighter than its brother and features a more durable camshaft and a DLC-coated cam chainguide. The new, two-piece, molded airbox is roomier than last year, but it still has a bad case of asthma. Airbox. The airbox is a two-piece construction instead of last year’s three-piece unit. It is still closed off to most incoming air. This is aggravated by the larger electronics tray that holds the battery, fuel-pump relay, master relay and black box over the air-filter opening. There is a new airboot between the filter and throttle body that features a new venturi shape. Clutch. 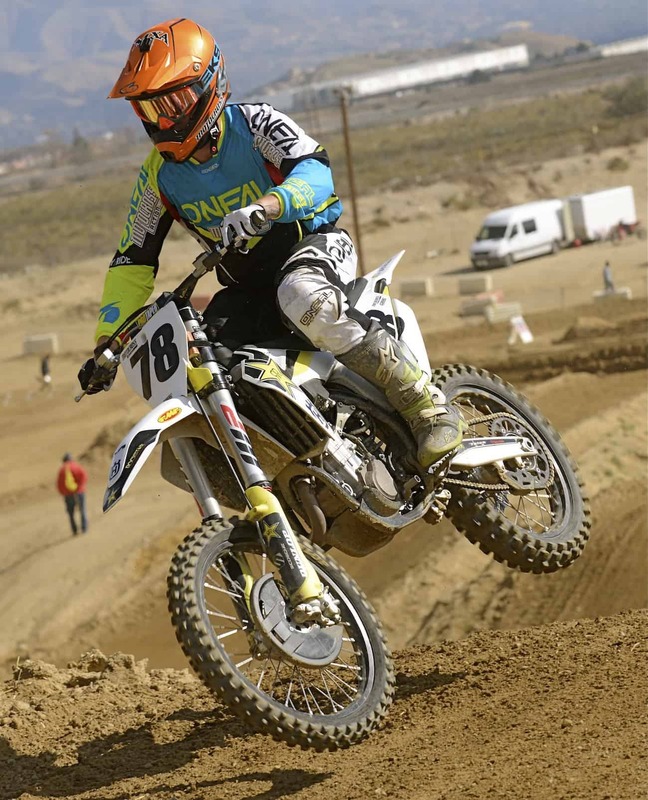 There are no changes to the Belleville washer-activated Husqvarna clutch. It uses Magura hydraulics, unlike the KTM Factory Edition, which uses a Brembo master cylinder and slave unit. The Rockstar Edition gets a Rekluse clutch cover, but there is nothing Rekluse behind the cover. Transmission. Although all the gear ratios are identical to the 2018 production bike, the Rockstar Edition’s transmission is produced by Formula 1 supplier Pankl. Pankl was already making the Husqvarna’s crankshaft. There are different maps for selected gears. The Husky muffler is different from the KTM Factory Edition muffler in that it has a restrictor way down inside and the canister shape is different. Exhaust. 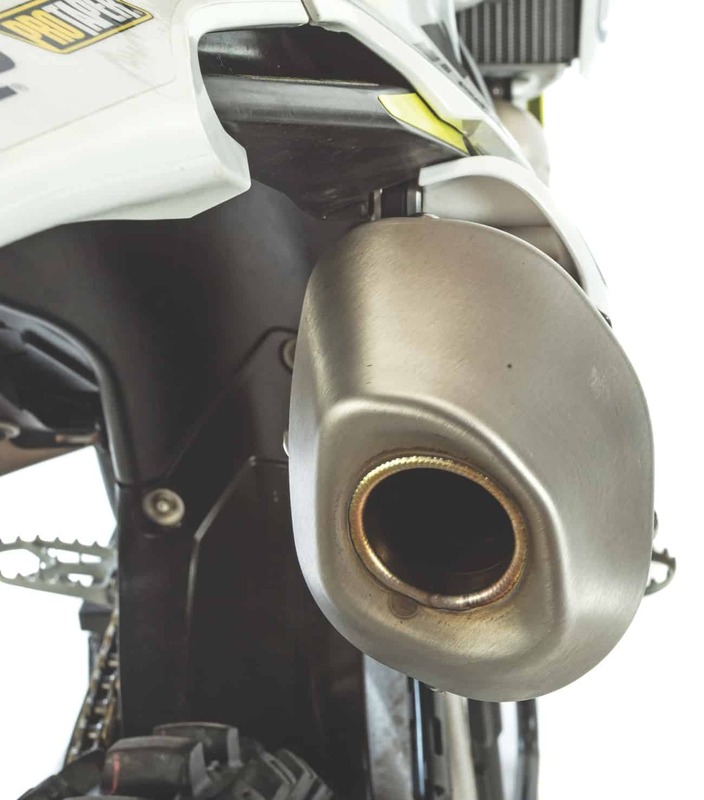 The Rockstar Edition exhaust is shorter, with a larger resonance chamber, shorter muffler and slip-fit in the mid-pipe (to allow the pipe to be removed without having to take the shock off the bike). Additionally, the muffler still has the infamous ice-cream-cone restrictor in it. The head stays, which doubled as pipe mounts on the 2018 production FC450, have been moved to make room for the slip-fit juncture. In MXA’s sound tests it passed the two-meter-max sound test. Throttle body. The Keihin 44mm throttle body on the Rockstar Edition breathes into a new air boot and intake port shapes. Timing. Cam timing has been changed for more bottom-end power. Maps. The maps have been changed on the Rockstar Edition. The stock map (#1) is slightly mellower, while the aggressive map (#2) is slightly more aggressive. The goal was to have a bigger difference between the two maps. Last year’s bodywork was a one-piece panel that went from the radiators to the rear fender. The 2018-1/2 FC450 has conventional radiator shrouds, airbox cover and a quirky winglet below the airbox cover. Q: HOW DOES THE ROCKSTAR EDITION’S CHASSIS DIFFER FROM THE 2018 PRODUCTION FC450? A: Apart from the two-stroke looking exhaust system, most racers will not notice any of the engine changes, but they will instantly see the new look. Frame. The 2018-1/2 Rockstar Edition’s frame has new rigidity characteristics. Longitudinally it is 5 percent more rigid and torsionally it is 10 percent more rigid against twisting. Most of these increases in rigidity come from a thicker cross brace on the down tube, which not only increases frame rigidity but improves the strength of the head tube area, which suffered some failures in the past. The geometry on the hydro-formed, laser-cut and robot-welded frame remains the same as last year, with a 26.1-degree head angle, 22mm offset and identical weight bias. Subframe. The new subframe is a two-piece design that saves a half-pound. Although Husqvarna lists it as a carbon fiber subframe, it is 70-percent plastic with 30-percent carbon fiber particles mixed in. Radiators. The radiators are mounted 12mm lower on the frame for better mass centralization, and the cross-over tube that moves water from the right radiator to the left radiator is much larger in diameter to flow more fluid. Brakes. 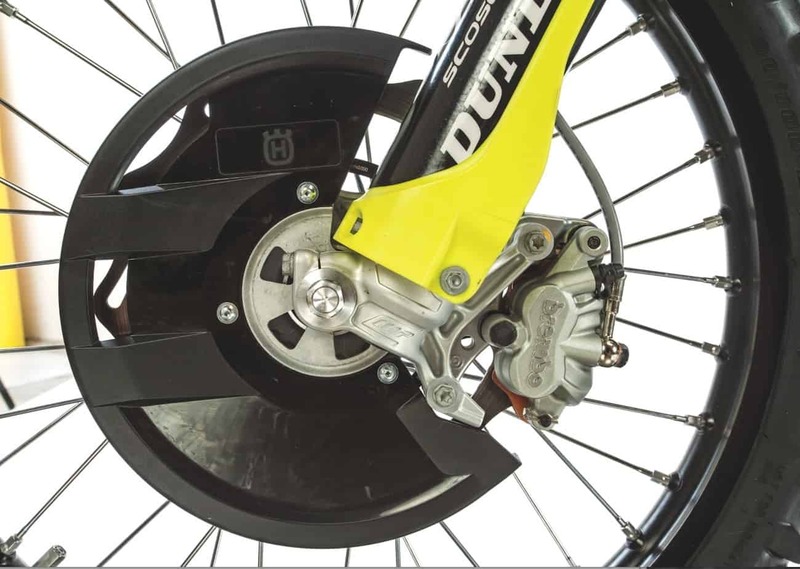 The biggest change to the Husqvarna front brake is that the 260mm front rotor is floating and made by Galfer instead of being solid-mounted like the 220mm GSK rear rotor. The Rockstar Edition comes with a black front disc guard. Wheels. 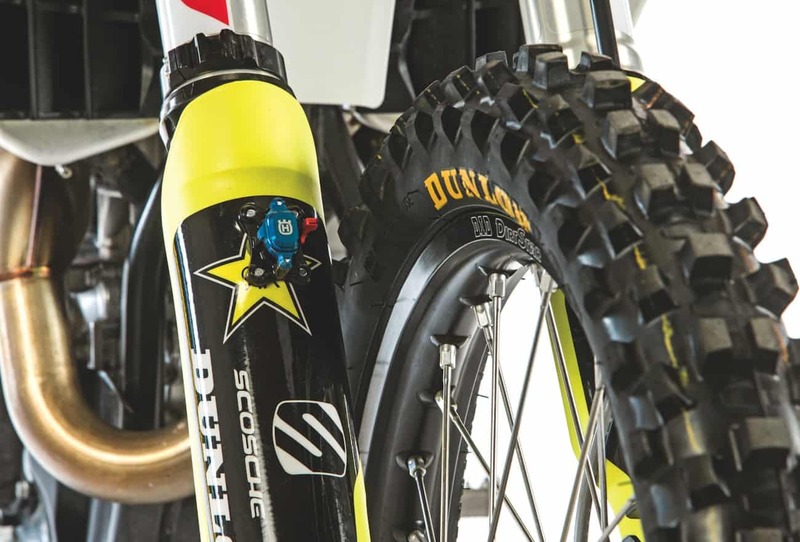 The D.I.D DirtStar rims and cast but machine-finished hubs are identical to the production FC450 wheels, but a two-position holeshot device is standard on the Rockstar Edition. Gas tank. The fuel tank has the same capacity, but is more compact. Note the increased height of the gas cap and lowered section on the left side of the bike. The fuel line has been moved inward for a straight shot at the EFI throttle body and for added protection. Skid plate. The skid plate is rubber-mounted and made from plastic reinforced with carbon fiber. Seat. The seat is still held on with one bolt, but the loose seat-bolt spacers are now molded into the seat bracket. The seat itself is thicker, softer and more rounded on the corners. The seat cover is pleated. Plastic. The new bodywork is no longer one piece on each side. In fact, it consists of a fairly standard radiator shroud, airbox cover and side-panel design (with strange winglets under the side panels). The ergonomics are much narrower. The big bulge at the back of the 2018 production FC450 has been greatly reduced, although some riders liked the bulges because they could grip them when leaning back. The biggest engine mod is to the cylinder head. It doesn’t share a single part with last year’s head and is 15mm shorter. Q: HOW DOES THE ROCKSTAR EDITION’S SUSPENSION DIFFER FROM THE 2018 PRODUCTION FC450? A: Although essentially the same fork, shock and triple clamps as on the 2018 FC450 production bike, each piece has been tweaked enough to make noticeable differences. Here is the list. Forks. The Rockstar Edition’s AER air fork features a two-stage base valve; recommended air pressure has been lowered to 10.5 bar or 153 psi. There is a spacer in the rebound (balance) side of the air chamber that reduces air volume by 50 percent. Compression damping has been softened in the initial and middle sections of the fork’s stroke, while the rebound damping is softer in the beginning and set up to move faster at the end of the stroke. Standard compression and rebound are set at 15 clicks out. Shock. The WP shock features a pressure-balanced design to keep internal pressures consistent. Overall, the compression damping is increased at low speed, slightly increased at mid-stroke and increased more at high speed. This should help in G-out situations. The spring rate remains at 45 N/m. Triple clamps. The revised triple clamps are 5mm wider (from front to rear), which makes them stiffer than the 2018 production triple clamps. There is a yellow plastic protector that extends from behind the front number plate to protect the bottom triple clamps from rock dings. Strangely, it only protects the top half of the bottom clamp from rock abuse. Handlebars. The ProTaper handlebar is 5mm lower, and have more rearward sweep. It is the old Ricky Carmichael bend. 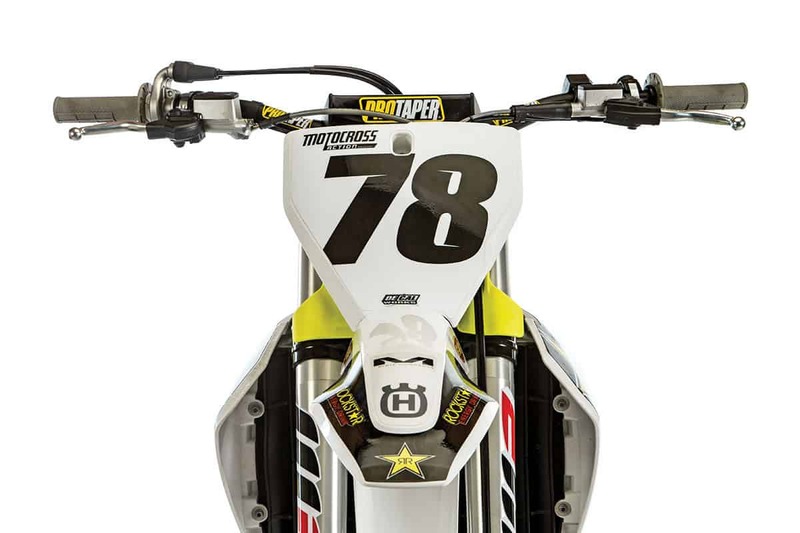 Handguards come with the bike. The yellow plastic guard behind the number plate lessens rock dings on the triple clamps. The top half anyway. Q: HOW FAST IS THE ROCKSTAR EDITION FC450? 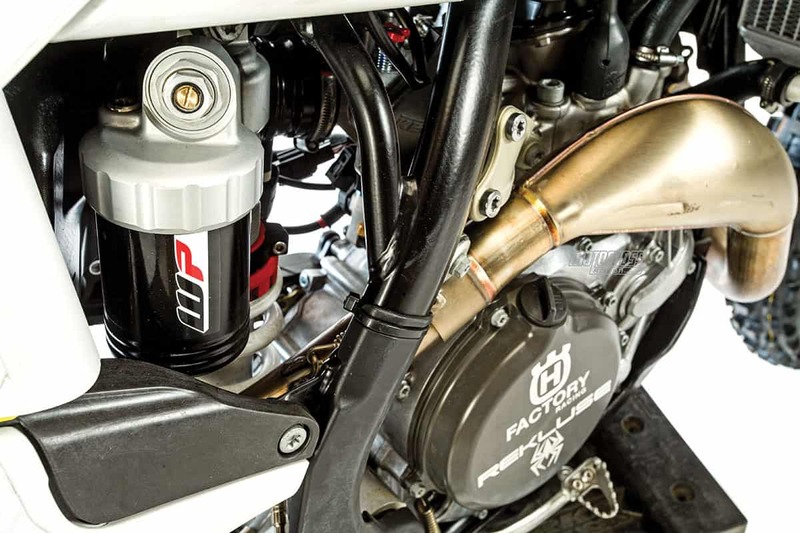 A: First and foremost, on the dyno the MXA wrecking crew didn’t see any major horsepower differences between the Rockstar Edition and the production FC450—save for more over-rev. However, in the saddle, the Rockstar engine had a freer-feeling rev. The power was so controllable and metered that most test riders said that they didn’t feel the need to keep a finger over the clutch. The power was much improved right off idle. It doesn’t bark, but picks up sooner and with less delay. It has a traction control feeling (even though it wasn’t in traction control mode). The power is much easier to utilize. When in map one, it delivered more torque and seemed to run better across the board, but for some reason had more engine braking, which was disliked. Map two revved out farther, felt freer and didn’t have as much engine braking, but gave up some of the superior traction that came with map one. Overall, most Vet test riders preferred map one, even if they complained about engine braking entering turns. Pros liked Map 2. To tell the truth, we expect better maps by the time the 2019 production bikes hit the showroom. Why? Because compared to the smooth, arcing power curve of the 2018 production bike on the dyno, the 2018-1/2 Rockstar Edition’s curve wavered up and down as though it was too lean. We couldn’t feel it on the track, but no engineer is going to let that pass without doing something about it. 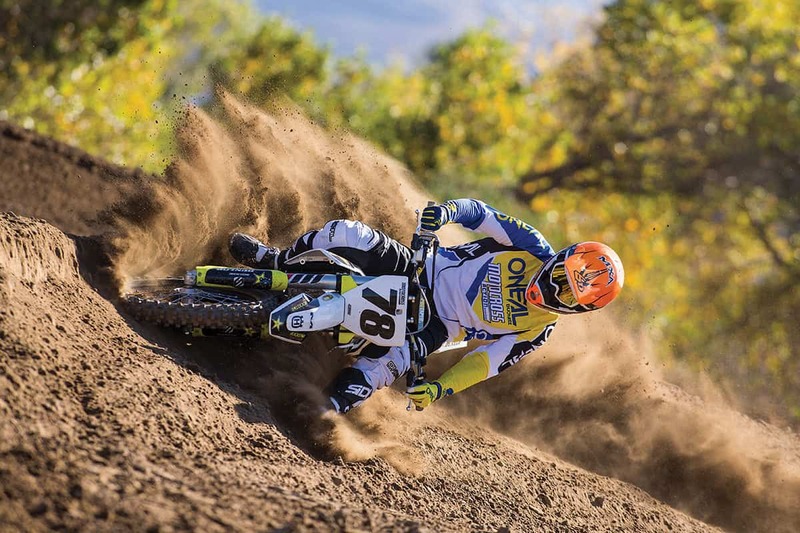 The Husqvarna Rockstar FC450 has an educated and sophisticated powerband. The smartest way to race it is to carry speed, keep your momentum up, and rely on late braking and smooth entrances. If you are a Bam Bam-style rider, don’t apply. This bike is built for tacticians who use the metered power to cover ground fast, not spray it into the air. Oh, don’t get us wrong; this is still a 58-horsepower machine that doesn’t have to bow down to anyone off the start or on fast straights; it just does it with less drama. Compared to its closest relative, the KTM 450SXF, the FC450’s power delivery is easier to manage. But, its friendly 450 personality pales in comparison to the KTM 450SXF Factory Edition’s snappier, more responsive and quicker power delivery. Don’t blame any of this on the crankshaft lobes, piston, exhaust or throttle body of the FC450 engine. The blame lies in our old friend, the Husqvarna’s closed-off plastic airbox. It doesn’t breathe, just as it didn’t breathe last year, the year before or the year before that. 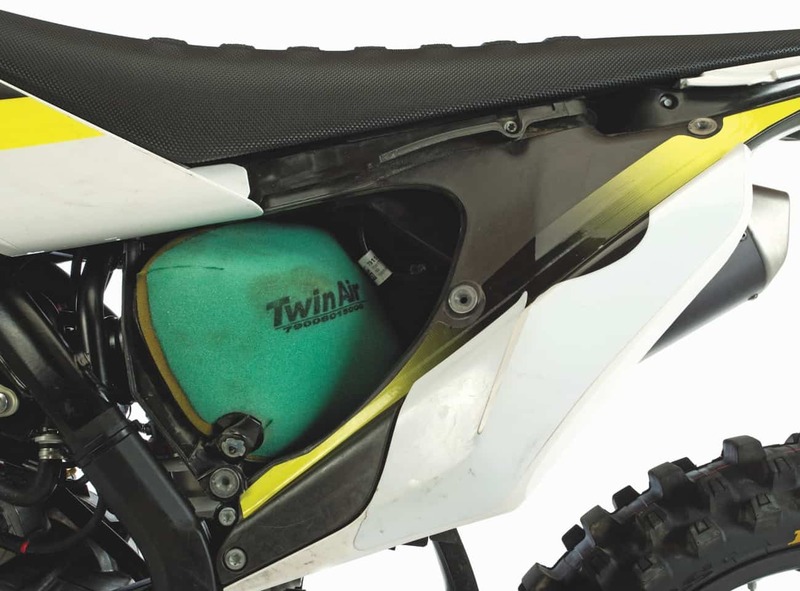 To prove it to ourselves and to the Husqvarna engineers, we pried the airbox cover open by 1 inch and sent test riders out to ride with the added airflow. Guess what? The FC450 was snappier, more responsive and had quicker power delivery. Q: HOW GOOD ARE THE ROCKSTAR EDITION FC450’S FORKS? A: Initially we had issues with the Rockstar Edition’s WP AER forks. The changes that WP made to the 2018-1/2 AER forks altered the setup quite a bit from the previous fork. The new forks exhibited some harshness at mid-stroke of their travel. Luckily, the air pressure is easily modified, which effectively changes the spring rate, so we lowered the air pressure to soften the forks in the middle. This worked, but our AMA Pro test riders felt that lowering the air pressure allowed the front of the bike to drop on corner entrances and to dive on the face of jumps. However, our Vet test riders were all for lowering the air pressure even more. Once we satisfied both the fast and slow test riders with their speciifc air pressure needs, we focused on the compression clicker. 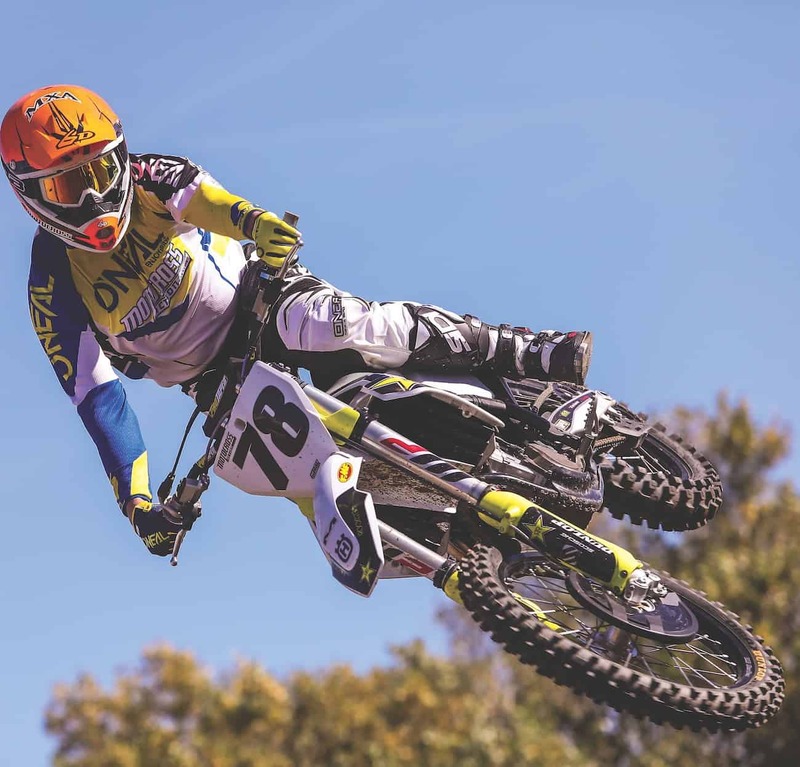 Surprisingly, four out of five test riders, regardless of their speed or age, selected the exact same clicker setting—which was all the way out.Their air pressures were vastly different, but their compression settings were the same. Thankfully, we brought our 2018 production FC450 to run back to back against the new fork. 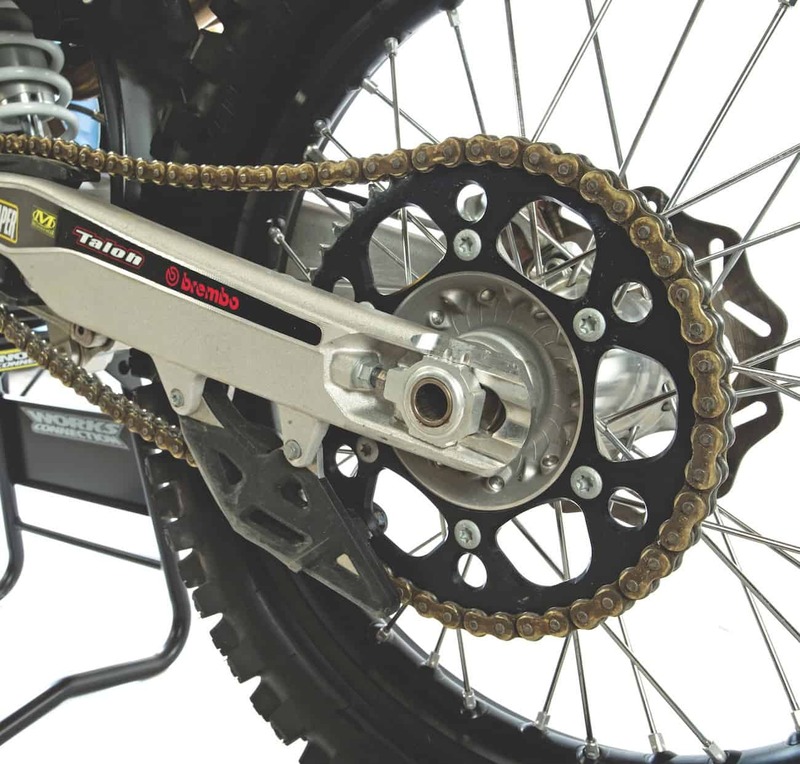 Test riders preferred the 2018 production fork. It was plusher and had compression clicks left when dialed in. Our goal was to find that comfort level on the 2018-1/2. It was important for us to find a solution that every rider could do without having to resort to expensive experimental fixes. We asked our WP technician to lower the fork-oil height in the damping leg by 10cc (just the damping leg, not the air leg). WP suggested 20cc. We went with their recommendation. With the lower oil height the forks got plusher, had no mid-stroke harshness and we had compression clicks to play with. For most skill levels, this setting was the most workable. The fast riders could run higher air pressures to hold the forks higher, while having a wider range of clicker adjustments. On the other hand, the slower test riders could lower the air pressure significantly to get full stroke out of the forks. As an added plus the forks broke-in completely around the five-hour mark, which made them follow the ground better in the little choppy stuff. We helped this sensation with two clicks less of rebound. The rear WP shock is much improved. It tracks straight, follows the ground, doesn’t G-out and is great in the rough. Q: HOW GOOD IS THE ROCKSTAR EDITION’S FC450 SHOCK? A: Brilliant. This is the best WP shock that we have ever felt. Coming out of corners you can get on the gas harder and have better traction from the rear in every situation. We fiddled with the race sag, varying from 103mm to 110mm. Some test riders chose 103mm, but most of their decision-making was aimed towards getting the front and rear balanced. 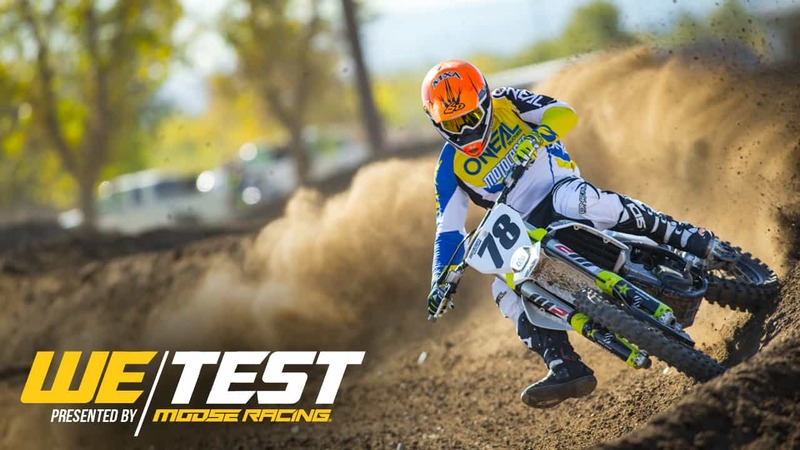 Overall, the majority of test riders ran 105mm for race sag. Q: HOW DOES THE ROCKSTAR EDITION FC450 FEEL ON THE TRACK? A: How a bike handles isn’t always determined by its frame geometry, which in this case is identical to last year’s excellent chassis, but by a bunch of ever-changing variables. Here’s a rundown. Handlebars. The 5mm-lower handlebars give the FC450 a more compact feel. But, half of the MXA test riders wanted to return to last year’s bars, which were not only taller but straighter and slightly narrower. With the taller seat and lower bars, there was some thigh-banging in the berms. Plastic. The new contact patch for the riders to grip is narrower than last year’s bike, but it is much better where you squeeze and use your legs the most. Frame guards. The black frame guards actually match the black frame on the 2018-1/2 much better than the black guards did on last year’s white frame. As always, some test riders felt that the frame guards made the frame wider at the pegs and didn’t grip as well against the rubber material on their boots as bare metal. Seat. The more plushly padded seat and its rounded corners don’t beat you up as bad as the previous square seat did. The rounded corners make leaning from side to side much easier. However, the seat made the ride height taller and, conversely, made the bars feel much lower than 5mm. Controls. The Magura clutch has a much softer pull than the Brembo clutch on the KTM 450SXF. The test riders were split between the smooth Magura clutch feel versus the KTM’s more distinct release point. Cornering. In the beginning of our test we had issues at turn-in because the forks didn’t want to stroke smoothly at corner entrance. 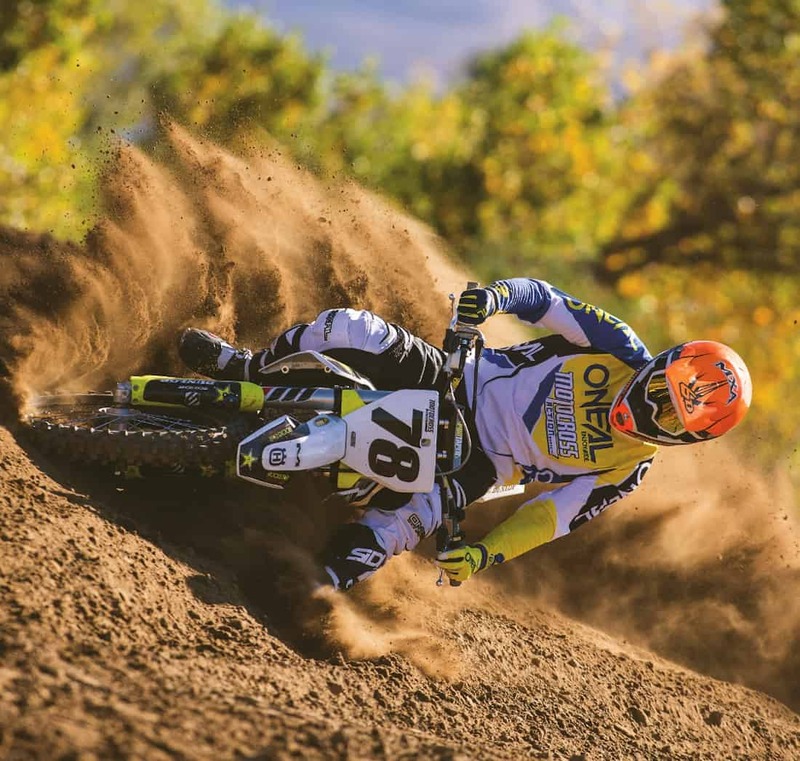 Once we tracked down the proper air pressure and clicker settings for each indiviual test rider’s skill, speed and weight, the Rockstar Edition was perfect. Turn-in got better when we lowered the oil height, which made the forks get deeper into their stroke before stiffening up. As always there is a delicate balance between oil height, race sag and fork height, as changes to one end affect the other. The MXA test riders didn’t expect any issues with the cornering of the 2018-1/2 Rockstar Edition because it is the identical chassis of the sweet-handling 2018 production Husqvarna FC450. Q: HOW MUCH DOES THE 2018 HUSQVARNA FC450 WEIGH? A: The same as last year—224 pounds. Yeah, we know that we said that the engine was 1 pound lighter, but the Husky gained that pound back in other areas. It is 2 pounds heavier than the KTM 450SXF, but as much as 15 pounds lighter than some Japanese 450s. Q: WHAT IS THE RETAIL PRICE OF THE 2018-1/2 HUSQVARNA ROCKSTAR EDITION FC450? (1) Magura clutch slave seal. 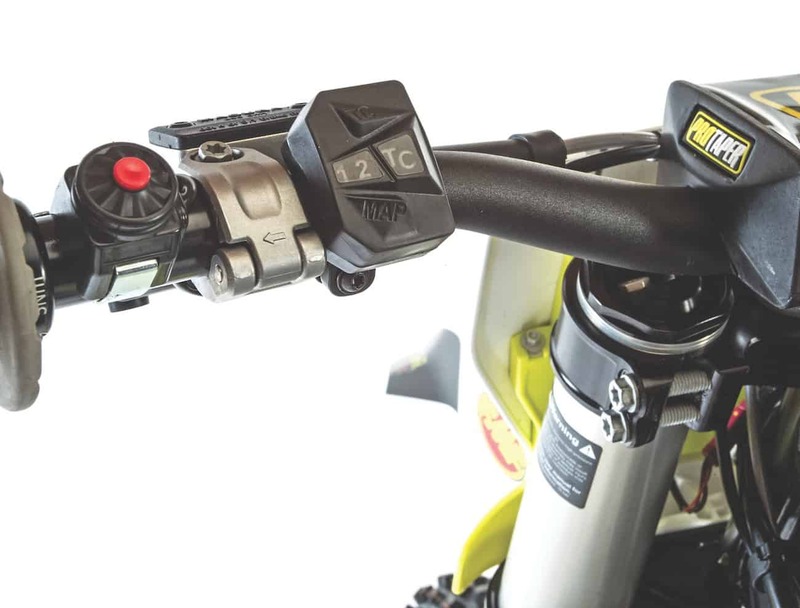 We don’t know if Magura upgraded the seal in the Husky’s clutch slave unit for the 2018-1/2 Rockstar Edition FC450 or if they plan to fix this failure-prone part in 2019, but we sure hope so. (2) Exhaust. Thanks to the slip-fit in the mid-pipe, you can remove the FC450 pipe without having to remove the shock. However, to remove the side-panel winglet that serves as a pipe guard, you have to find and remove the bolt hidden behind the winglet. Take our advice and let the pipe cool down before attempting this. (3) Sprocket/spokes. Watch the sprocket bolts closely. They loosen up constantly. (4) Front brake hose. Be very careful when hooking tie-downs onto your handlebars that they don’t crimp the L-bend tube coming out of the front brake’s Brembo master cylinder. (5) Seat bolt. You remove the seat by removing the airbox cover, which pops on and off, which allows you to access the single bolt that holds the seat on. Really, this is not a big issue, but unlike last year’s bike, you have to remove the seat to remove the radiator guards (because the radiator guards are held on by wood screws). This isn’t different from any other bike on the market, but is different than last year’s pop-off, full-length, plastic panels. (6) Airbox. We swear that less air is getting to the Husqvarna engine this year than last year. Drill holes in the airbox (rearward of the filter) to bring it back to life. (7) Winglet. We broke, more accurately shattered, two left-side winglets. They were both damaged in crashes. Still, the way they broke encouraged us to carry a spare left-side winglet with us to the races. (1) Spacers. Last year when you removed the seat or the one bolt on the right side panel, the spacers would fall out. We grip glued them in place. On the Rockstar Edition, Husky molded them into the panels. (2) Weight. It is 2 pounds heavier than the KTM 450SXF, but we aren’t going to quibble about 2 pounds when the YZ450F, CRF450 and RM-Z450 are over 15 pounds heavier than the FC450. (3) Air filter. After years of having to wrestle big filters through small holes, the KTM/Husqvarna air-filter design is a blessing. The Husky’s jumbo-sized airbox cover requires a healthy tug. (4) Hydraulic clutch. This Belleville washer-activated clutch is stout enough to last a full race season without being touched. The Rekluse clutch cover is just added bling, because that is what the race team uses. (5) Skid plate. A skid plate is always a plus. Nothing is more expensive to replace on a four-stroke than the engine cases, water pump and ignition, so any protection is appreciated. A: The chassis improvements are more impressive than the updated engine, but both show solid improvements. You may have wanted more out of the first-ever Husqvarna “homologation buster,” but what would that be? 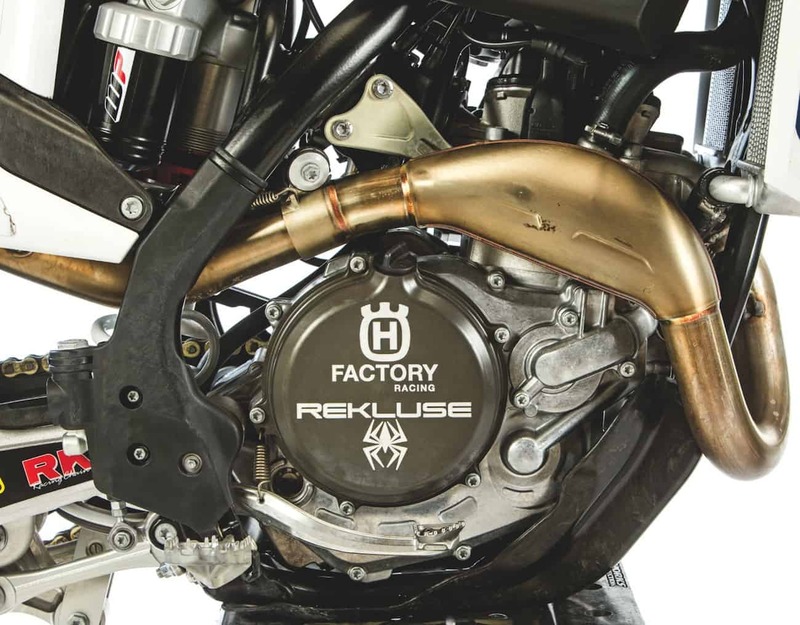 With a bike as good as the 2018 Husky FC450, you can’t expect the Austrian engineers to reinvent the wheel. The 2018-1/2 Husqvarna FC450 doesn’t obsolete the current model. It refines it and defines it. It fixes glitches and scratches itches. This is not a watershed machine, that was the first Factory Edition back in 2012. This is its offspring. The gear: Jersey: O’Neal Hardware; Pants: O’Neal Hardware; Helmet: 6D ATR-1; Goggles: Viral Brand Factory Series Pro 3; Boots: Sidi Crossfire 2. 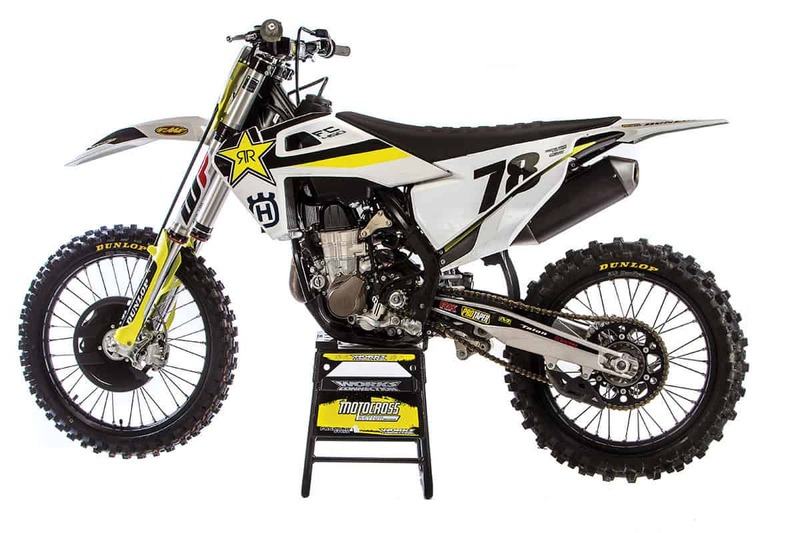 This is how we set up our 2018-1/2 Husqvarna FC450 Rockstar Edition for racing. We offer it as a guide to help you find your own sweet spot. Notes: We lowered the oil height in the damping leg by 20mm of oil to eliminate a harsh spot in the travel. Additionally, pay attention to extreme temperature changes. You may have to change the AER’s air pressure as it gets hotter later in the day. We bled the outer chambers between motos. Notes: We turned the high-speed compression damping in a quarter-turn to lessen G-outs and run more rebound than the recommended setting. Additionally, we set the sag at 105mm instead of the WP-recommended 110mm.